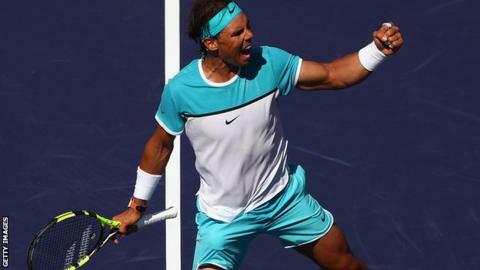 Rafael Nadal beat a top-10 player for the first time this year as he saw off Kei Nishikori to reach the BNP Paribas Open semi-finals in Indian Wells. Fourth seed Nadal, the champion in 2007, 2009 and 2013, won 6-4 6-3 against Japan's world number seven. The Spaniard will face world number one Novak Djokovic, who beat seventh seed Jo-Wilfried Tsonga 7-6 (7-2) 7-6 (7-2). "I beat a top-10 player and that is something that is important for my confidence," said Nadal, 29. "I feel I am strong mentally and I have the right energy. I am able to fight for every ball and I now believe in myself the whole match." Four-time champion Djokovic was pushed hard by Tsonga but the Serb proved stronger in the tie-breaks than the Frenchman, taking his record for 2016 to 20 wins and one defeat. "The fact that I have beaten somebody that was feeling good throughout the week, somebody that serves big and plays quick and efficient precise forehands, that gave me a lot of trouble, is going to help my confidence,'' said 28-year-old Djokovic. The pair have played each other 47 times, with Djokovic 24-23 ahead. "It's a game of cat and mouse," he said. "In a way, mentally, who is going to be on top first usually ends up as winner. "I know the very beginning of the match is very, very important so I'm going to try to start well." Canada's Milos Raonic will take on Belgian David Goffin in the other semi-final.